Nashville Downtown Partnership. A Brllnt case study. Organized in 1994, the Partnership has transitioned into a downtown leadership organization that focuses on business recruitment and retention, residential and retail development, public space management, access and transportation, communications and marketing. Brllnt partnered with Geocentric to update the design and user experience of both Nashville Downtown and Park It Downtown sites. 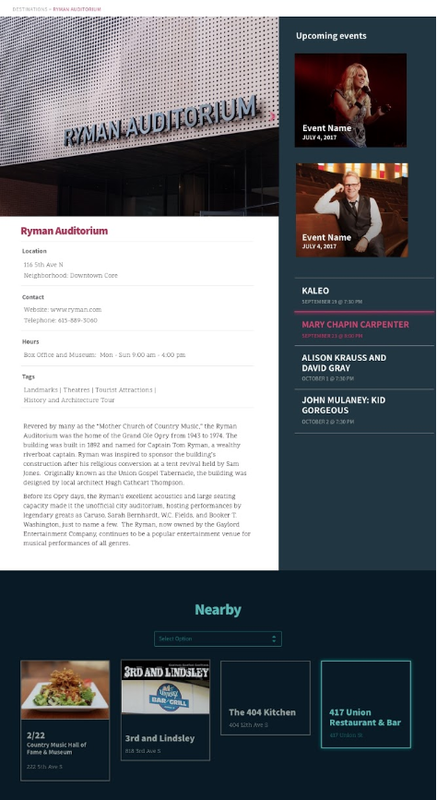 Our main objectives were to improve the user flow, simplify access to information, and infuse the sites with the vibrance of downtown Nashville. 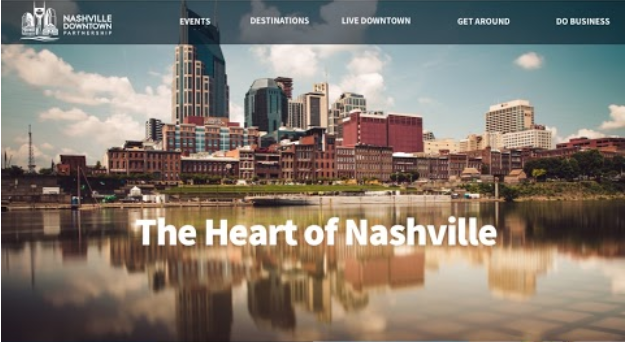 Objective || Design and improve the user experience of two websites, Nashville Downtown and Park It Downtown, to improve access to information and channel the city’s vibrant spirit. 1 year after site launch, Nashville moves from 13th to 11th most desirable city to live in the US. 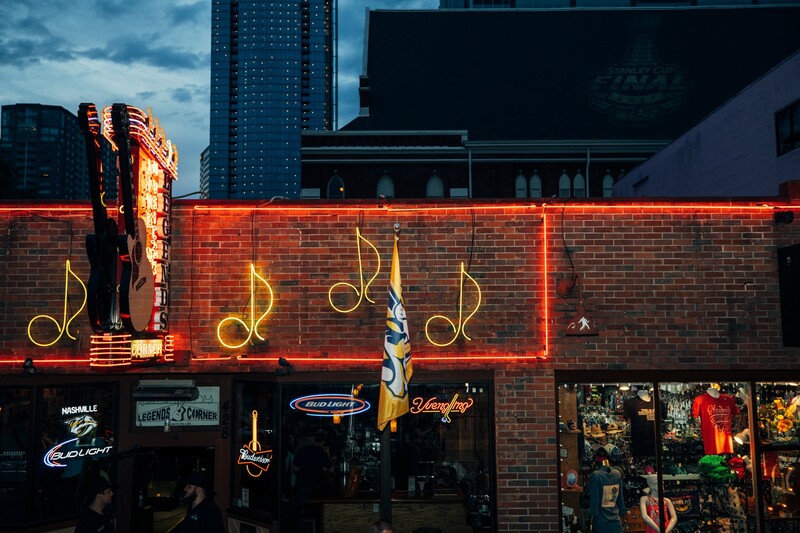 Ranked the 13th most desirable place to live in the US, Downtown Nashville needed clear messaging and compelling visuals to position itself at the level of competitive cities. Being a world-class city for events and venues, it’s not hard to attract visitors to the city — but convincing them to stay, and even move, downtown has been a challenge. “The Heart of Nashville” is a message that embodies the pulsing music, energy and beauty that resonates from the streets of downtown. If home is where the heart is, why not move to the very heart of the state, and country? 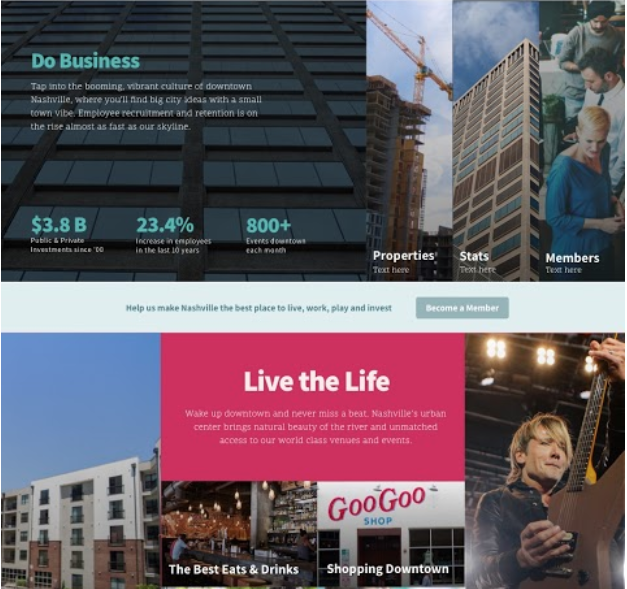 Beautiful imagery and video of the city and its residents creates a vibrant user experience from page load to exit. Inspired by the lights and sounds of downtown Nashville, we created user interactions that mimic neon lights. Bold, friendly typography emulates the fun and lively downtown experience. Events are what primarily drives visitors to both venues and parking in the city, thus they are prominently positioned on the home page. We paired this element with statistical insights to build interest and deepen the user’s investment from attendee to resident or business owner. The previous site was very cumbersome to navigate, so we constructed a mega menu that allows website admins to highlight key items for each category, increasing access to key information while minimizing the number of clicks to get there. Guiding the user through the site with bold images simplifies their experience and ensures they arrive exactly where they intended, while encountering a few other interesting opportunities along the way.